Francis Twining was born in Thompson Buildings, St Aldate’s, Oxford in 1848 and baptised at St Aldate’s Church on 7 May. His father Robert Twining, who was a stonemason, was distantly related to the Twining’s tea family. His mother, Mary Ann, surname unknown, was born in Evesham, Worcestershire in 1811. Her first marriage was to William Green a servant, by whom she had a son, Edward Green, baptised at Leckhampton, Gloucestershire on 24 July 1831. Francis's parents Robert Twining and Mrs Mary Anne Green were married in about 1835, and they began their married life in Kenilworth, Warwickshire, where their first child Maria Twining was born in 1837. They then moved to Bromsgrove in Worcestershire, where their son Henry Twining was born in 1839. By 1844 they had moved to Oxford. Their son Robert Twining junior was born at Gravel Lane in St Mary Magdalen parish and baptised there on Christmas Day 1844. By the time Francis himself was born in 1848 they had moved to Thompson's Buildings in St Aldate’s, and the 1851 census shows Francis (2) living there with his mother Mary Ann (39), who was working as a dressmaker, his half-brother Edward Green (18), who was a labourer, and his full Twining siblings Maria (13), Henry (11), and Robert (6). Francis's father was probably working away from home as a stonemason. SHOCKING ACCIDENT.—On Saturday last an accident of a fatal character occurred to Robert Twining, a man belonging to Oxford, when about a mile from the Winslow Railway Station. It appeared that he was on his way hence, walking along the permanent way, when the last train to Oxford ran him down. The body was conveyed to Winslow, where an inquest was held before D. P. King, Esq. Mr. Donne, the surgeon, said the skull was fractured, as was also the leg, and the foot was completely smashed. The fracture of the skull was the cause of death. Deceased was a stonemason, was employed at Addington Church, and was a steady sober man. Mrs Twining and the children are hard to find in the 1861 census, although they were almost certainly still in Oxford in 1864 when Francis's sister Maria was married. . When he left school in the early 1860s, Francis Twining first worked as a grocer’s boy for Grimbly Hughes at 55–56 Cornmarket. Sidney Twining (born on 21 May 1884 and baptised on 10 June at St Ebbe's Church). When his first son Ernest was baptised in January 1871, Francis Twining was a just a grocer’s assistant, living at 6 Orchard Street, St Ebbe's, and the 1871 census shows him aged 24 living there with his wife Elizabeth and their eldest son, Ernest (four months). Francis's mother, Mary Ann Twining, was now widowed and living with her daughter Mrs Maria Cox and family at 25 Cranham Street. When Francis Twining's next son Owen was baptised on 26 December 1872, he was living over his own grocer's shop in St Ebbe’s Street. In 1879 a vacancy arose in the West Ward of the city following the death of James Grainge, and the only candidate was Francis Twining, who was duly elected on 24 April. On 2 September 1882 Jackson's Oxford Journal reported that Francis Twining, grocer of St Ebbe's Street, had applied for a licence to sell spirits by retail, and the Bench was bound to grant the licence. At the baptism of his youngest child in 1884, Twining’s address was given as 23 and 24 St Ebbe’s Street, indicating that his shop had expanded. In November 1885 Francis Twining, despite not being a freeman, was elected Sheriff of Oxford. By 1887 Twining had moved to Llantrisant House at 78 Kingston Road, near the corner of St Margaret's Road. Jackson's Oxford Journal of 15 January 1887 reported that he had been summoned to the Oxford City Police Court for not clearing the footway properly of snow outside his house: he was fined 1s. and 8s. costs. By October 1890 Francis Twining moved into a new home, Summertown House on the Banbury Road: this was outside the parish boundary and deemed to be in Wolvercote. This was given as his address when he was nominated to stand as Liberal candidate for the South Ward that month. In the 1891 census Twining (43), described as a wholesale grocer, was living at Summertown House with his wife Elizabeth (48) and his children Ernest (20) and Owen (18), who were both described as grocer’s assistants, and Lottie (17), Gilbert (14), Francis (11) and Sidney (6), who were still at school. They had one domestic servant and a sick nurse. In September 1893 Twining applied for a licence for the North Parade stores, where he had another grocer's shop. In 1895 Twining bought the 25 acres of Hawkswell Farm, which he combined with the 25 acres of Stone’s Estate and in 1901 put plans before the council to lay out Portland, Lonsdale, King’s Cross, Victoria, Hamilton, and Lucerne Roads. On 18 March 1899 Francis Twining bought the White Hart Hotel at 21 Cornmarket for £8,000 at auction. In September 1899 Twining was granted a licence to sell spirits at 164 Cowley Road. In October 1899 Twining was elected as a candidate for the North Ward. Two of his sons married two sisters in 1899 and 1900. At the time of the 1901 census Francis Twining (53), described as a wholesale grocer, was home at Summertown House with his children Owen (28) who was a grocer’s assistant, Lottie (26), and Sidney (16) who was a clerk. The family had one servant. His wife Elizabeth (58) was paying a visit to Annie Johnson (73) in Standlake. On 22 August 1907 at Summertown Church, Francis Whitlock Twining (27) , a grocer of Summertown, married Dorothy Rose Diddams (25) of 69 Banbury Road, the daughter of the lodging house keeper Albert Diddams. In 1909 Alderman Twining donated the site of the new church at Summertown. On 25 August 1910 at Kew, Surrey, Sidney Twining of 30 Lonsdale Road married Winifred Grace Ware of St Anne's, Kew. In 1911, Francis (63), now described as a merchant, was living at Summertown House (which had 15 rooms not including the bathroom) with his wife Elizabeth (67). They had two servants. Their six surviving children, all now married, had left home. By 1915 Francis (in partnership with his son Ernest) had six Twining Brothers branches throughout Oxford: the original shop at 23/24 St Ebbe’s Street, 53 Cornmarket Street; 16 North Parade Avenue, 46 High Street; 56 St Aldate’s street, and 294 Banbury Road. Twining's youngest son Sidney fought as a Private in the London Regiment (London Scottish) in the First World War and died of wounds in Salonika at the age of 32 on 27 February 1917 (CWGC entry). He is remembered on the war memorial of the Boys' High School in George Street. In 1919 Alderman Twining gave £500 to purchase the site of the Summertown War Memorial. In 1935 Twining still had six shops, but some were in larger premises: 15–19 George Street; 164 Cowley Road; 15 North Parade Avenue; 83 & 84 High Street; 294 Banbury Road; and 3 Woodstock Road. All of these except the High Street branch were still open in 1955. By 1976, however, the only branches that survived were at 16 North Parade Avenue and 3 Woodstock Road. Twining represented the Conservatives on the North Ward of the City Council serving first as Councillor and then as Alderman for a total of 50 years. 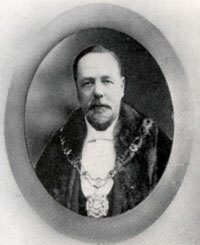 In 1905 he was elected Mayor of Oxford (for 1905/6). On 1 May 1920 Francis Twining and his wife celebrated their golden wedding and were pictured in the Oxford Journal Illustrated of 12 May. In 1927 Francis's wife Elizabeth Twining died at Summertown House the age of 84 and was buried at Wolvercote Cemetery on 30 June. † Alderman Francis Twining died at Summertown House at the age of 81 on 30 August 1929 and was buried with his wife at Wolvercote Cemetery on 2 September (C1/90). His obituary notice in the Oxford Times stated that “he had for many years done good work with that quietness and lack of ostentation which marked his private and business life”. His effects came to £82,967 17s. 7d., and his executors were his sons Ernest and Gilbert and the farmer William Whitlock Mobbs. His surviving sons Ernest, Gilbert, and Francis Twining took over their father's business and operated as Twining Bros.
Summertown House, described as an important freehold of nearly 2½ acres with considerable potentialities for immediate development as a valuable building estate, was put up for auction by Messrs Herbert Dulake & Co on 26 May 1939. His eldest son Ernest William Twining died at 76 Lonsdale Road on 21 January 1936; Gilbert Twining of 105 Lonsdale Road, Oxford died at the Acland Hospital on 28 August 1946; and Francis Whitlock Twining died in Oxford at the age of 90 in 1970. In 1955 the City Council agreed to rename George Street in Summertown Twining Street, but 62 residents of the road signed a petition against this, as they did not want to livevsomewhere named after a grocer's shop, and it was instead named Middle Way.